Fat Albert and the Cosby Kids was an animated television series conceived of, produced, and hosted (in live action bookends) by comedian Bill Cosby, who also lent his voice to a number of characters, including the titular one. Filmation was the production company for the series. The series, based upon Cosby's stories about growing up in the inner city of Philadelphia, ran on CBS television from 1972 to 1984, and spent a few more months in first-run syndication in 1984. Several prime-time holiday specials featuring the characters were also produced. The music for the series was written and performed by jazz pianist/keyboardist Herbie Hancock in 1969 and was released on the album Fat Albert Rotunda. Like most animated series' at the time, Fat Albert and the Cosby Kids contained a laugh track. The Fat Albert Gang's character images were primarily created by the artist Gladstone, Randy, Hollar, with the assistance of onetime Disney animator Michale McKinney, under the direction of Ken Brown (who had collaborated with Cosby in the early 70's in an effort to syndicate a comic strip with Kings Production in NY. After this venture failed Filmation took over and began the animated television series). The Fat Albert and Gang images have seen huge sales by FUBU and other T-shirt producers. In 1979, the show was re-titled The New Fat Albert Show and featured a pair of new animated segments: "The Brown Hornet" (detailing the adventures of a larger-than-life African-American crime fighter in outer space) and "Legal Eagle" (involving a crime-fighting eagle and a pair of bumbling police squirrels). 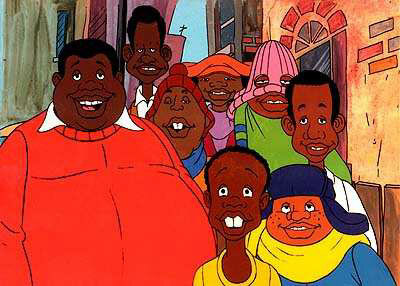 In 1984, the show was syndicated and renamed The Adventures of Fat Albert and the Cosby Kids. It ended the same year. In 1989, NBC aired reruns for a few months. Fat Albert first appeared in Cosby's stand-up comedy routine "Buck Buck," as recorded on his 1967 album Revenge, and then was featured in a 1969 one-shot prime-time television special (Hey, Hey, Hey, It's Fat Albert). Filmation produced the show, which was noted for its educational content. During each episode, Fat Albert and the gang dealt with an issue or problem commonly faced by young children, ranging from stagefright, first loves ("puppy love"), and skipping school to harder, more serious themes (toned down somewhat for young children) including smoking, stealing, racism, being scammed by con artists, and even child abuse and drug use. A particularly notorious late episode began with a parental advisory by Cosby for its blunt subject matter. In it, the kids have a brush with the law; although the police realized they were completely innocent in the matter, they are still subjected to a frightening tour of an occupied high security prison where they are verbally accosted by the inmates. Most of these more "serious" episodes introduced a new character (never seen again after that single episode) who introduced the gang to the problem of the week. Rudy was the one who always fell for temptation, taking the quick and easy path; while Fat Albert would play the skeptical role, trying to resolve the problem and save his friends from temptation. Fat Albert: Gonna Have A Good Time! Fat Albert: Hey, Hey, Hey! Fat Albert and his friends try to help other kids with their problems while they take out time to play a little music.